If you walked by the old Tower Records store on 4th Street and Broadway yesterday, you saw a construction zone, a familiar sight over the last four-plus years since the iconic NYU record store shut down. But if you walk by there tomorrow, you'll see something new entirely: two dudes sitting and watching baseball. You'll see that every day for the next six months. A month back, Major League Baseball put out an ad for a "dream job," which involved sitting in an apartment in New York City and watching every single baseball game all season. It turns out, the "dream job" was living in the MLB Fan Cave, which opens tomorrow. The two men who will be living in the "cave" are Mike O'Hara, 37, and Ryan Wagner, 25. They will stay in the space, fishbowl-like, for every day of the regular season. The cave features three 60-inch screens and twelve 32-inch screens, with every game running at all times. It also will feature pool tables, a "Bud Bar," a tattoo studio, a D.J. booth, a pitching mound, and, helpfully, Ms. Pac-Man. It's part of MLB's social-media strategy — fans who walk around outside are encouraged to use touch screens outside to "tweet at the cavemen!" — and is a fascinating short-term project. (They have rented out the space for only one year.) There is an event space downstairs, complete with "Champagne rooms," for private events. MLBFanCave.com will also have regular "webisodes" involving O'Hara and Wagner, and they will do daily live check-ins with the crew of MLB Network. "We consider it like an ongoing Broadway show," says Jeff Heckleman, a PR staffer for MLB. The whole project has come together shockingly quickly; O'Hara and Wagner learned they'd be spending the next six months in a room together just two weeks ago. The space is still heavily under construction; yesterday, we actually stepped on a live cordless power saw. 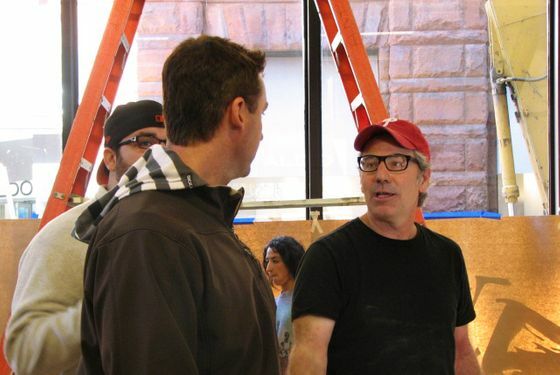 The construction, which everyone claims will be ready by tomorrow (something that, considering the chaos we saw yesterday, strikes us as unlikely), is being supervised by Paul DiMeo of ABC's Extreme Makeover, who was there yesterday filming the process and introducing O'Hara and Wagner to what they were in for. If you're sad that you weren't chosen for the "dream job," blame your lack of acting experience. Both O'Hara (a Yankees fan) and Wagner (an Orioles fan) are professional actors. O'Hara is a stand-up comedian who had a walk-on part as a waiter in Parks and Recreation, and Wagner is a stage actor who left a traveling road show of The Wizard of Oz in Cheyenne, Wyoming, to join the Fan Cave experience. (He was the Cowardly Lion's understudy.) "We both have a sketch-comedy background," Wagner says, "so we're ready for the experience." O'Hara says he hadn't found much luck during pilot season — he also is in a band called the Mighty Regis — and figured this would be "an awfully fun gig." The Fan Cave will not be open to the public ordinarily, but you can walk by anytime there's a game on over the next six months, and you'll see O'Hara and Wagner watching games, filming webisodes, and sitting on the couch. So if you're wondering what the heck is going on in there when you drunkenly stumble by at midnight, that's what's going on. Feel free to tweet at the cavemen.